Shoulda been there a coupla weeks ago on my mates SV, but he didn't have any money. If ya need any help or advice gimme a shout. You don't need to spend loadsa money on more power, just mod it to go in straight lines without wheelying or spinning up! whats the differnce between sprintin n drag racin ? tweed and handlebar moustaches ? Thats less than 10 miles from the Watchfield where we had the rally this year. Sprinting is all bikes divided into road bikes and race bikes. These are divided into cc groups, like 750 to 1000 and unlimited. They go off sometimes two at a time or one at a time. The object is not necessarily to beat the other guy, just set the fastest ET in your class. Drag racing is always one against one. The bike position is controlled by the timing lights, pre stage, staged, amber , green. Reaction times, 60ft, 130 ft times are measured as well as ET and Terminal speed. The object is to launch on or just before the green and be the first to complete the 1/4 mile, so reaction times are important. The competition is usually a knockout or a round robin. If you fancy having a go on yer roadbike, just turn up at a Run What You Brung event, pay entry fee and RWYB fee and you can do as many runs as you want to queue up for. Can usually race yer mates. If you wanna get serious or avoid doing wheelies, there are a few mods you can do for not a lotta cash. Spending thousands on the engine is not the way to go. My old "Road Legal" GSX1100ET with a stock 998 Katana engine ran 10.37 ET. nice machine, 10.37's a stonking time. I do miss my old ET. Just wish the guy who owns the SV would spend a little bit of cash, we could run a 10.9 this year. 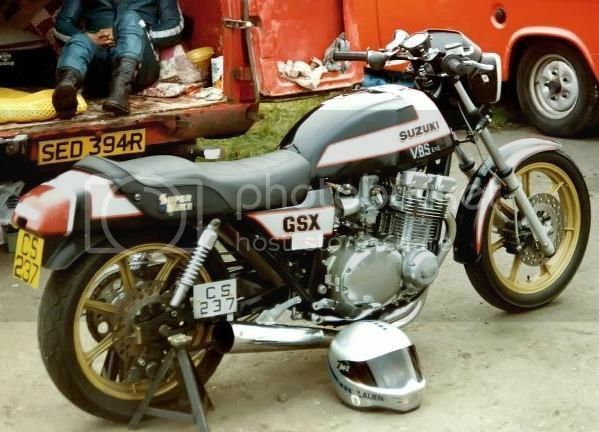 I started on my Z1000ST in 81, a supercharged, 750 Morgo Triumph on methanol in 82, GSX1100ET streetbike in 83 and 1260/1325 Pro Stocker from 84 until 88. 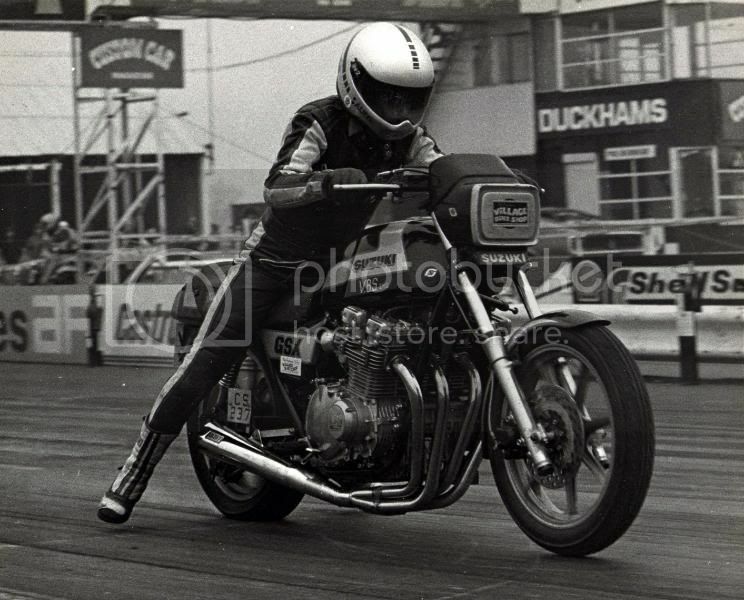 Did you ever come accross a fella by the name of Malcolm Gentry, he was from Daytona motorcycles in Ruislip, ran a Kawasaki. Heard of that name, but never met him?